Behringer-Crawford Museum has partnered with acclaimed local artist Cedric Cox to create a one-of-a-kind, “community art” painting to be owned by one lucky bidder. Cox’s Working in Progress No. 2 began as a paint-by-numbers outline which was then transformed with color by BCM patrons of all ages. 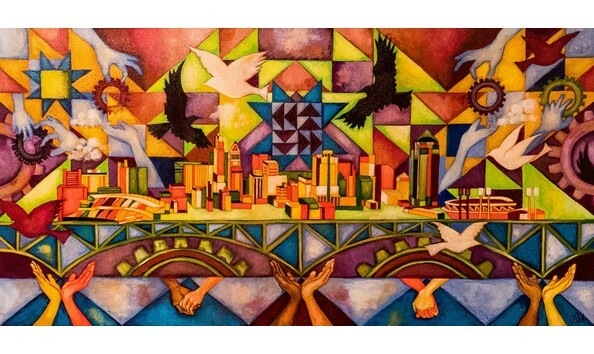 The result is 30´x 60” acrylic on canvas -- a vibrant geometric depiction of the Cincinnati skyline view from Devou Park, which Cox says "is inspired by the economic growth of our region and all our aspirations for a brighter future for humanity." “For the past eight years I have been a proud participant of freshArt and helped BCM raise money to continue its educational outreach efforts, but it’s even a greater honor to have a painting that was created with families and the BCM community,” Cox said. Cedric Michael Cox is best known for his paintings and drawings which fall between surrealism and representational abstraction. He has exhibited locally and regionally and won numerous grants and awards, including the Individual Artist Grant from the city of Cincinnati, a Congressional Award and the Yeck Artist in Residency at the Dayton Art Institute. Bidding on Working in Progress No.2 opens at 6 p.m. Thursday, March 21, 2019 and closes at noon on Tuesday, April 30 2019.